Hemoglobin is an oxygen carrying pigment, which is present in red blood cells.It has two parts. One is called heme which is a prosthetic group. And the other is goblin protein. Heme containing proteins are present in aerobic animals. And concerned with the transport of oxygen. Heme part is same in all the animals. The difference is in the globin chains, that have different aminoacids in different animals. 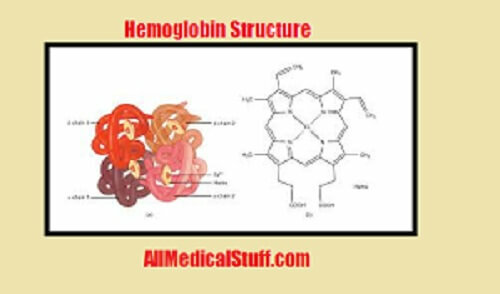 Here in this post you will learn about structure of hemoglobin i.e its amino acids chains and heme part as well as different functions of hemoglobin. Heme has one central iron, which is attached to four pyrol rings. The iron is in the forum of ferric ion. The pyrol rings are connected by methylene bridges. Globin is the protein part and consist of four chains. In human, there are two alpa chains and other two may be beta,delta,gamma or epsilon depending on the type of hemoglobin. The main function of hemoglobin is to carry oxygen from the lungs to all the tissues of the body. This is due to the affinity of hemoglobin for oxygen. When hemoglobin comes in contact with oxygen, it combines with it and form oxy-hemoglobin. This is a week bond. When blood reaches to tissues, where oxygen is deficient, the bond is broken and oxygen diffuses out to tissues. Some of carbon dioxide is transported from tissues to lungs through hemoglobin. Although the majority of it is transported via plasma but still it carries some of CO2 to lungs. Hemoglobin also acts as a buffer.Buffer means to resist change in pH.Blood has 7.4 pH and it remains in the narrow range.Because, if it changes the life of the person may be endangered.Therefore, hemoglobin plays very important role in keeping the pH of blood constant. Hemoglobin plays an important role in the modulation of erythrocyte metabolism. Not only for oxygen, but hemoglobin act a very important role the transport of various drugs to their site of action. Hemoglobin is a source of various physiological active catabolites. 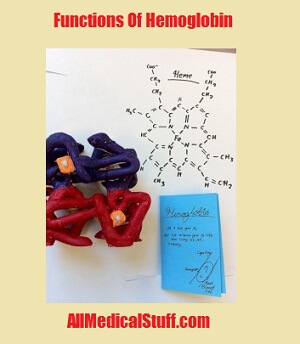 These are some of the important functions of hemoglobin. There are many other functions. And may be there would be many other functions, which would be still unknown. A lot of research work has been done in this field and still there are many mysteries to be solved. Not entirely happy with the buffering action, quite vague. Why would the life of the person be endangered if the pH is changed from the narrow range? And HOW is it kept at that range? because many enzymes act at a specific range and if you change the pH most of the enzymes would not work which can lead to various complications and death. pH is kept at narrow range by compensations of lungs and kidneys…there are specific regions in brain that sense pH changes. in respiratory acidosis or alkalosis kidneys are the main compensatory organs while in metabolic acidosis or alkalosis both lungs and kidneys are compensatory organs. Haemoglobin does not bond with other haemoglobin to form oxyhaemoglobin as stated here; it is the process of oxygen combining with haemoglobin. i have added image of structure and secondly it is not a book. it is just an informative post. Thank u so much hamza..I HV prepared my notes from the information u shared about Hb…it was really helpful…. welcome. glad that my post helped you. Best information for preparation of notes on Haemoglobin molecule…. Thank you, short and informative! However, please could you explain number 7 for me please. will try. but i have gained the knowledge from biochemistry books like chaterjee, lippincott and satyanarayana etc. also mention allmedicalstuff.com in your work as a reference.